Lync Server 2010 has a long history at Microsoft. The first steps in Instant Messaging (IM) and Presence Information were in Exchange 2000. Exchange 2000 had these additional server roles where you could build an instant messaging solution. You had to install the Windows Communicator on your workstation and the MSN Communicator network. After Exchange 2000 these functions were separated; Exchange 2003 did no longer contain IM functionality and IM and presence were continued in a product called Live Communication Server (LCS) 2003. Via LCS 2005 the product turned into Office Communication Server (OCS) 2007 followed by OCS 2007 Release 2. This version, which is the predecessor of Lync Server 2010 also contained rich functionality when it comes to Enterprise Voice. OCS 2007 R2 could accept a SIP trunk from your provider, making it a full telephony system. Also OCS2007 R2 could be integrated with Exchange Server 2007 Unified Messaging to create a full featured voice mail system. The current version is Lync Server 2010 and although it’s pretty new it already has a long history within Microsoft. So, Lync Server 2010 is Microsoft’s solution for Unified Communication, and it’s a pillar in the “new way of working” scenario’s. With Lync you can be available anywhere and anytime and you’re very flexible with the way of working and communicating. Using Lync you can use Instant Messaging to communicate, you can see other user’s presence information, you can use the conference features or you can use it as a telephony system. The cool part is, you can connect it to your provider using a SIP trunk. This way telephone calls are not delivered using a normal telephony system, but via the Internet. All normal phone calls are delivered to the Lync Server, and the Lync Server delivers the call to you. Your client can be the Lync Client on your workstation and when connecting a head set (which can have the appearance of a normal phone) you can have normal phone calls. You can also use a Lync Phone; this is a phone that’s not connected to your workstation but is connected directly to the network. The phone automatically logs on to the Lync Server, whether it be in the office or somewhere in a datacenter. It is also possible to forward the incoming calls to a mobile phone (can be costly!) or directly into the voicemail box of your Exchange Server 2010 Unified Messaging Server. 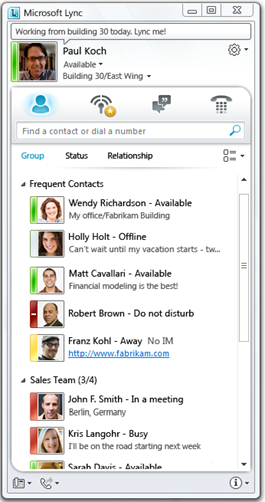 A typical Lync scenario is where a company wants to use Lync for instant messaging and presence. Personally I don’t see too many customers implementing a full featured enterprise voice solution in the beginning. And Lync needs to be available internally and externally. But what’s the difference between MSN instant messaging and Lync instant messaging? Well, MSN IM is public and open to anyone. It is possible to create an account that’s absolutely fake, where you try to impersonate somebody else. So I can create a MSN account not being “Jaap Wesselius” but being “Bill Gates” for example. From an MSN point of view you wouldn’t notice. Lync on the other hand is a secure solution. To start using Lync on the Internet you need your own domain name, and the Lync servers are using certificates that identify the company. So, an account called jaap@contoso.com really tracks back to the “contoso.com” company and to the user called “jaap”. The Edge Server is not like the Exchange Edge Server a store-and-forward server but it is more like an application layer firewall. The reverse proxy is needed for all kinds of web publishing, like the address book download of the Lync Web App. Domain joined clients on the internal network use the internal (Active Directory integrated) DNS to resolve the address of the Lync server. Then they use in to the Lync server using the credentials of the user on the workstation. Domain joined clients on the Internet, or other clients, query the public DNS for information regarding the Lync environment. When the information is retrieved from the public DNS the clients can connect to the Edge server in the DMZ. Unlike previous versions of Lync Server 2010 (i.e. OCS 2007 R2 and older) Lync does not use Active Directory anymore to store configuration data. This is really adventurous or daring in a Windows and Active Directory environment. Although this is not without a reason: in a large enterprise environment it is not that easy to make changes in Active Directory, especially in the Active Directory’s schema. But instead of storing the configuration information in Active Directory it is now stored in a SQL Server; this SQL Server is called the Central Management Store. When using a Lync Enterprise Server a separate SQL Server can be used (SQL 2008 R2 is now supported!) and the Lync Standard Server uses a SQL Express installation. From a performance perspective there’s no need to worry. The CMS is only used as a storage location for configuration data. Every now and then it will be contacted and read, but that’s very limited. So, since the configuration is stored in the CMS the installation process of Lync changes. First you have to design and store your configuration, then you can build your Lync server. When you just install the DVD and start installing you will end up somewhere where you don’t want to be, and pretty soon too! 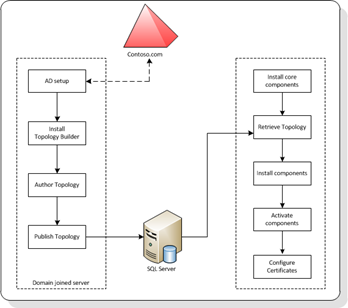 To assist you in building a Lync environment, Microsoft created the Topology Builder. This is a small application that let you create an XML file where the complete configuration is stored. The Topology Builder is comprised of a wizard where all variables can be entered. You have to be aware, there’s no checking of the input. If you don’t pay close attention you can enter the country for example (NETHERLANDS) where you actually have to enter the country code (31). You also have to be aware of naming conventions, external domain names versus internal domain names. The SIP domain would be something like “contoso.com”, while the internal FQDN of the server might be something like “lync01.contoso.local”. If your Active Directory domain name is the same as your SMTP domain name or your SIP domain name you’re fine, but this is not always the case. When finished with the topology builder you can continue with the installation of the actual Lync server. From here you will import the topology (from the CMS) and build the new Lync Server, and thus according to the configuration file that was created earlier. And after some configuring like the creation and installation of certificates (there’s a real neat wizard here!) and making the DNS changes you’re ready to go! The Lync client can be installed on the domain clients and when everything went right you should be able to start the Lync client, see each other’s presence and maybe start an IM session. For management purposes in OCS2007R2 you had to rely on several MMC snap-ins and these various snap-ins were not really integrated with each other. 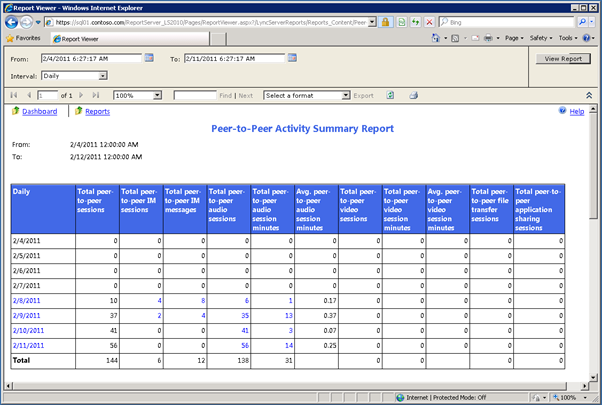 In Lync Server 2010 there are two management tools available. 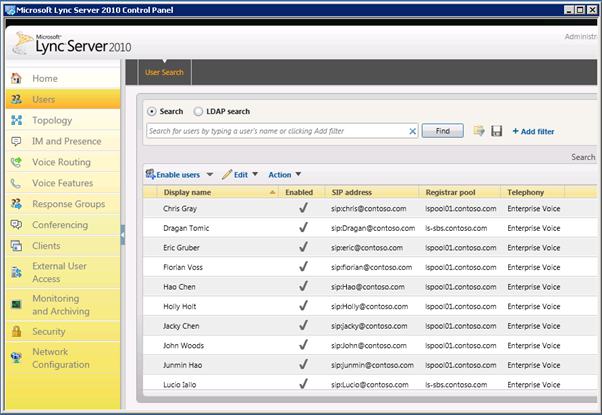 There’s the Lync Server Control Panel which is actually a Microsoft Silverlight application. The control panel is a very powerful tool and very easy to use. There’s a navigation pane on the left hand side and a large details pane in the middle. Where needed multiple tabs are available to separate the various functions. The most important options are available in the Lync Control Panel. The Lync Control Panel is built upon the Lync Management Shell (just like Exchange Server actually) and when nitty gritty details are not available in the Lync Control Panel they are available in the Lync Management Shell. Also for bulk management the Lync Management Shell can be useful. I’ll get back on this in future posts around Lync Server 2010. Lync Server 2010 is Microsoft solution for Unified Communications and as such one of the pillars of “the new way of working”. With Lync Server 2010 you are very flexible when it comes to communication methods, whether it be in the office, at home or on the road. The heart of Lync is the Central Management Store, this is where all the configuration data is stored and this is what’s used when building the actual Lync Servers. This is the topic of the next Lync blog post.